New Gen designer Danielle Romeril showcased her A/W 2015 collection against an apocalyptic backdrop made fragrant with liberal scatterings of heather. 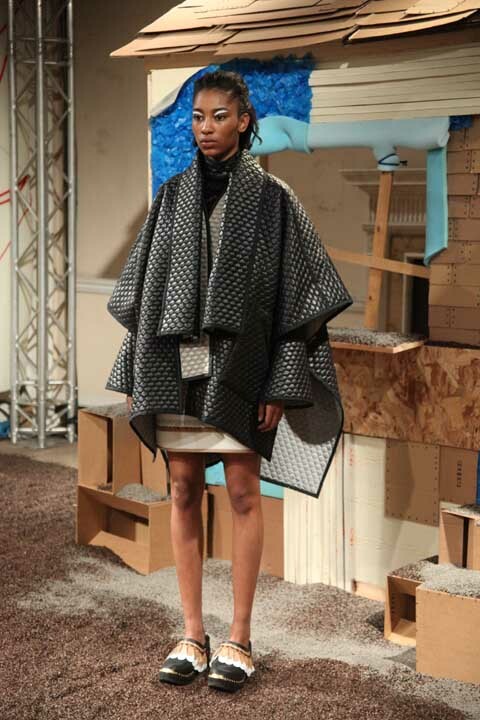 Models wore tumbling quilted capes, asymmetric plaid skirts with appliqué feathered hems and matching clogs. Black was offset with white trim and highlights of moss green, rock beige and seams of red. This was survival clothing for those with an eye for style, salvaging the best they can find. On Monday 16th September Cristina Sabaiduc presented her nature revering S/S 2014 collection with a short film and live models in the Canon Cinema at Somerset House. For their latest collection Tata Naka were inspired by the Ballet Russes, and their presentation took place in the new Studio space at Somerset House on Tuesday 17th September 2013. Luxury knitwear twosome Leutton Postle presented their S/S 2014 collection and film in the Canon space on Saturday 14 September. Georgian twins Tata Naka presented their new collection in the Portico Rooms of Somerset House on Tuesday 21st September 2011. Inspired by Pina Bausch, East Coast 50s style and featuring bright resort prints, this was as much fun as ever. You can't help but get all emotional when designers get a presentation right in this miserable financial climate. Teatum Jones did just that: putting on a great show at the RSA on Friday 16th September 2011. Mr Start showed his sartorial style at One Aldwych during Menswear Day at London Fashion Week… fab suits, shame you could barely see them… with illustrations by June Chanpoomidole, Joana Faria and Maria Papadimitriou! Milliner Piers Atkinson presented his latest collection in Frannie's Pop Up Gallery - taking his cue from cabaret and opium dens… Fabulous illustrations by Ankolie, Karolina Burdon, Joana Faria and Michelle Urvall Nyrén! Newcomer Christopher Beales presented When The Crystal Crack'd at the Rag Factory just off Brick Lane on Friday 18th February. Well, he may be new to the madness of showing during LFW, but this first class designer has certainly paid his dues. Very promising.